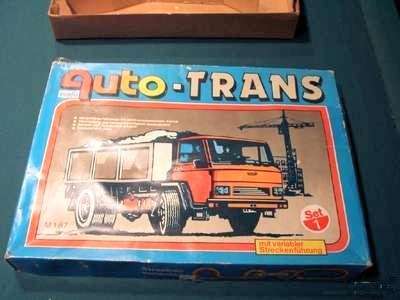 Apart from the better known models (which will also be listed here... someday) the Prefo factory also made a less known 'slot-car' set from 1987 until about 1990 which contained a motorized version of a Skoda truck model. The Skoda cab used was purchased from Permot-Prefo in Glashütte, all other parts were made by Prefo in Dresden. Compared to the normal Skoda model the Auto-Trans versions chassis is made of a different kind of plastic (polyamid) and the wheels have rubber tires. Where other manufacturers sets had to be hooked up to a DC transformer, the 'Auto-Trans' set can also be operated on 6 C-size batteries (= 9 volt DC). 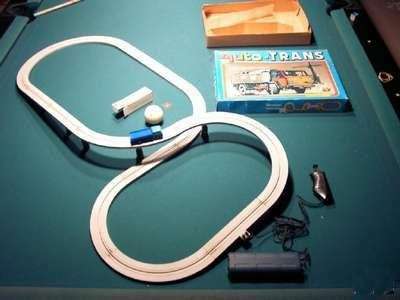 Another distinguishing feature of the 'Auto-Trans' set that is that it is single track instead of the commonly used double track. * All parts have also been sold seperately. 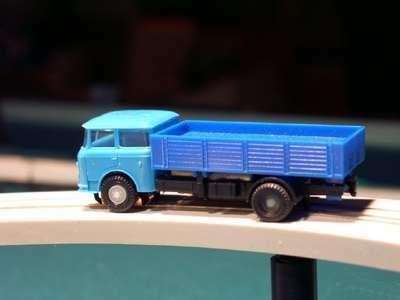 Models of a Skoda S706RT garbage truck were shown in action on the demonstration track at the 1989 Leipziger Messe but these have never been included in the sets.